Editor’s Note: While the Spotlight on Technology article is normally reserved for brand new technologies or those developed by first responders, in the wake of the recent mass shooting in Las Vegas, At the Ready is shining this month’s spotlight on but one of several gunshot detection systems. At the Ready makes no claim as to the accuracy and effectiveness of the systems discussed here. The information provided comes from the manufacturer’s website and is provided to inform responders and community governments of this tool that could help them to respond effectively to gunshot incidents. As always, At the Ready encourages responders to compare information on different systems and make educated choices when choosing to purchase any technology. ShotSpotter’s acoustic sensors are placed in and around cities and when a gun is fired, the sensors identify it through a series of complex algorithms that compare the sound of the shot to a massive database of recorded actual gun shots. Each detected shot is also time-stamped and the system uses triangulation to locate and place the shot to within 25-meters of its origin. 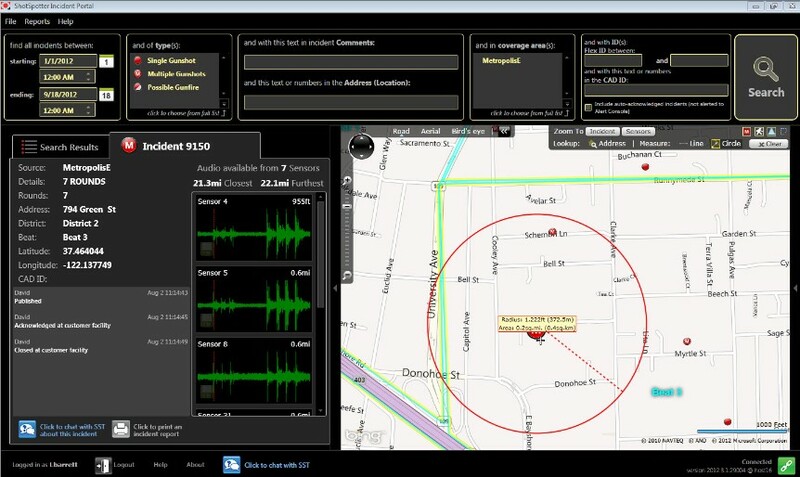 ShotSpotter’s Incident Review Center’s human experts confirm the classification produced by the machine and push an alert to law enforcement personnel usually in under 45-seconds. ShotSpotter’s indoor sensors can hear the gunshot and see an infrared flash that comes from the barrel of the fired weapon. The ShotSpotter system automatically notifies security personnel in under ten seconds. It also alerts law enforcement and first responder personnel through their mobile app, via text, and/or email. With the alerts, law enforcement personnel also receive information that provides context. ShotSpotter is already installed in 92 cities across the country and the world. The company claims on their website that these cities have experienced an average 35% decrease in gunfire incident volume in the first two years of use. ShotSpotter’s website states that Law Enforcement Officers in cities where ShotSpotter is installed rely on ShotSpotter to help in increased evidence collection, an enhanced feeling in the community that police care, increased community reported crimes, a decrease in persistent gunfire in the city, increase tactical awareness and response in the field and strengthen engagement between police and community members. The ShotSpotter website has testimonials from six police officials from cities where it is installed. The cities are: Somerville, MA; Milwaukee, WI; South Bend, IN; New Haven, CT; Richmond, CA; and Denver, CO. They have a testimonial page online. Since 2013, ShotSpotter has aggregated the gunfire data from cities in which it is installed. From this data, they publish a National Gunfire Index. These reports are reason enough to visit the company’s website. The indices contain compelling data such as: Total Number of Published Gunfire Incidents; Rate of Gunfire Incidents in City Areas; Rate of Gunfire Incidents by Region; Average Number of Gunshots Per Incident; Busiest Days and Busiest Hours of Gunfire Incidents; Single Incident with Largest Number of Rounds Fired; Number of Gunfire Incidents by Local Time; and Number of Domestic Incidents by Time of Day. The Indices can be downloaded here.